This was probably one of the best deals I've gotten off Groupon. RM99 per pax for 5 courses Japanese Appreciation Dinner. Thinking that we were heroes and 5 courses were not enough for us? 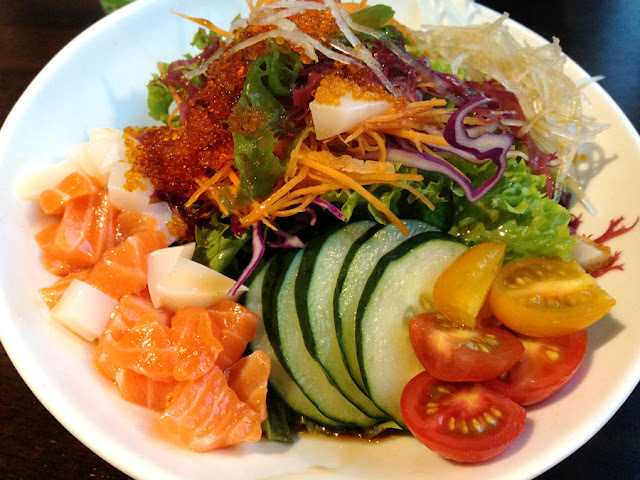 We added a Sashimi Salad from the Ala Carte menu. 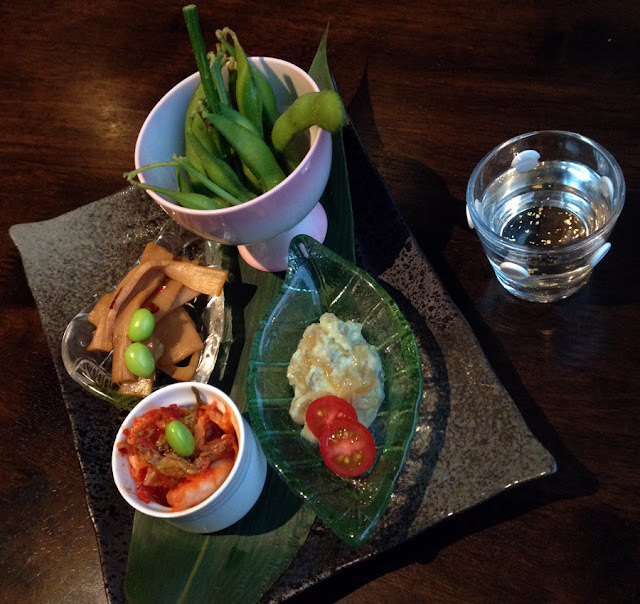 Shoku Moriawase, mixed Japanese appetisers - pause right there. No idea what is the Kimchi doing in the middle of Japanese appetisers. Other than the Edamame I did not like any of it. The bamboo shoots were horribly smelly. Being one of those who dislikes the smell of the bamboo shoots, I really cannot take it. I thought it was one of those from the canned ones, but they insisted it is freshly flown from Japan. Really, bamboo shoots are so smelly it smells like urine. All meals are accompanied with sake. As for this, we got 30ml of Takara Shochikubai Tokubetsu Junmai Sake. We get one of each Sashimi Moriawase, apparently it's imported. This, is damn good. The cuts were reasonably thick and boy the prawn is one of the best!! I really could use another plate of this. Too good! 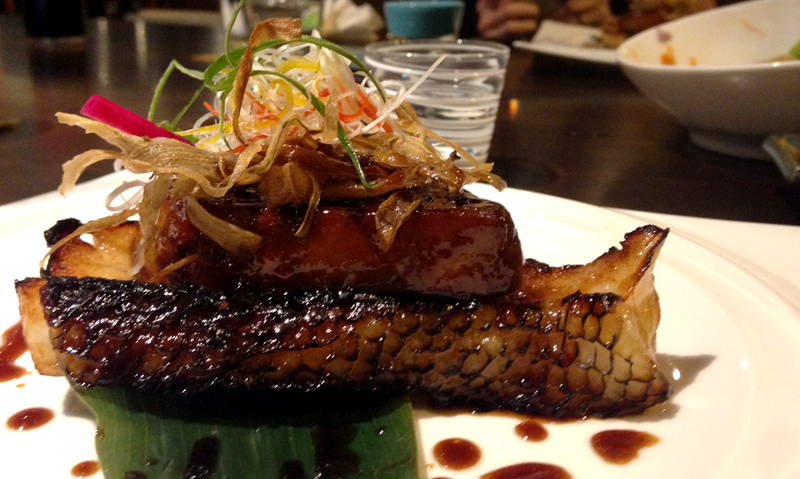 This is paired with 30ml of Takara Shochikubai Kimonto Junmai Sake. Here comes the 3rd course. 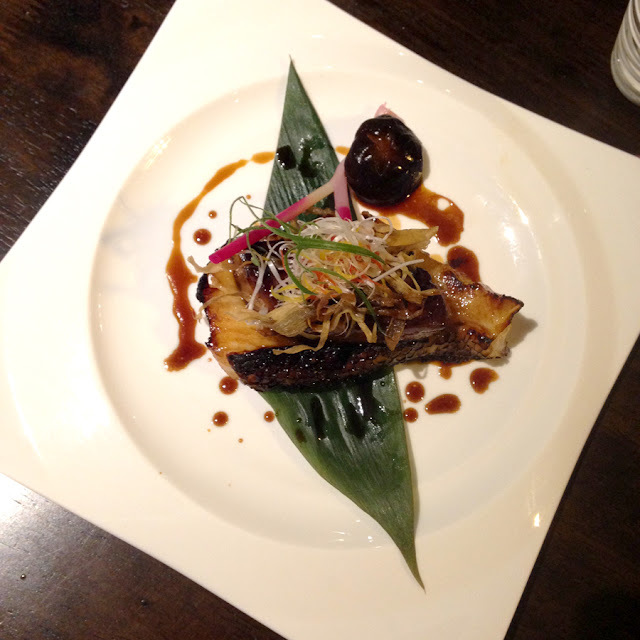 Foie Gras Gindara Shioyaki, Grilled Cod topped with Goose Liver. Portion is pretty huge! By the end of those dish I couldn't feel myself already. 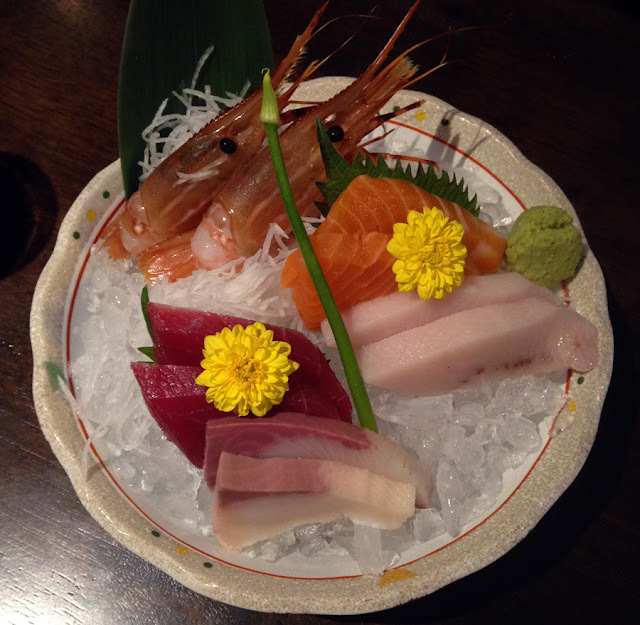 It is paired with 30ml of Takara Shochikubai Junmai Daiginjo Sake. 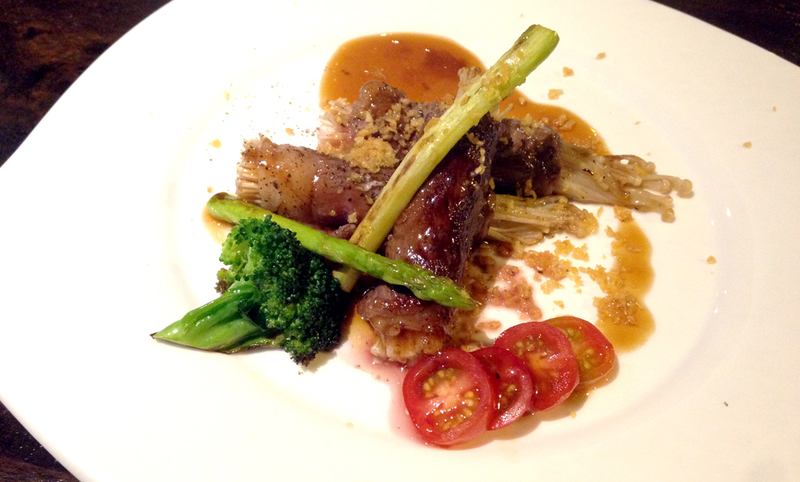 I really could not finish the Wagyu Niku Yaki, Grilled Australian Prime Beef wrapped with Mixed Mushrooms. I've obviously overestimated ourselves! It is paired with 30ml of Takara Shochikubai Yamahai Daiginjo Sake. 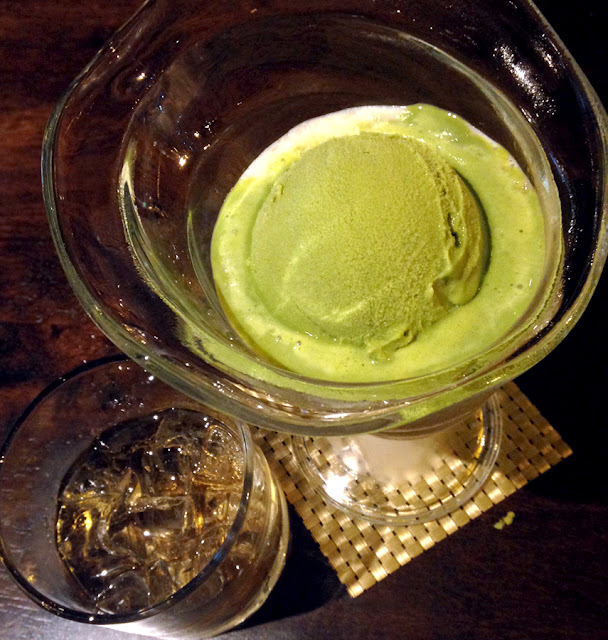 There is always room for dessert - Green Tea Ice Cream with Kinaku Yoghurt. Paired with the sweet Umeshu Sake, 30ml. All of those, for only RM99?! That's RM198 for the both of us. Not bad for the dishes and they all came with Sake pairing. Even though we may not feel the difference for the sake part, but we are still in the learning process! 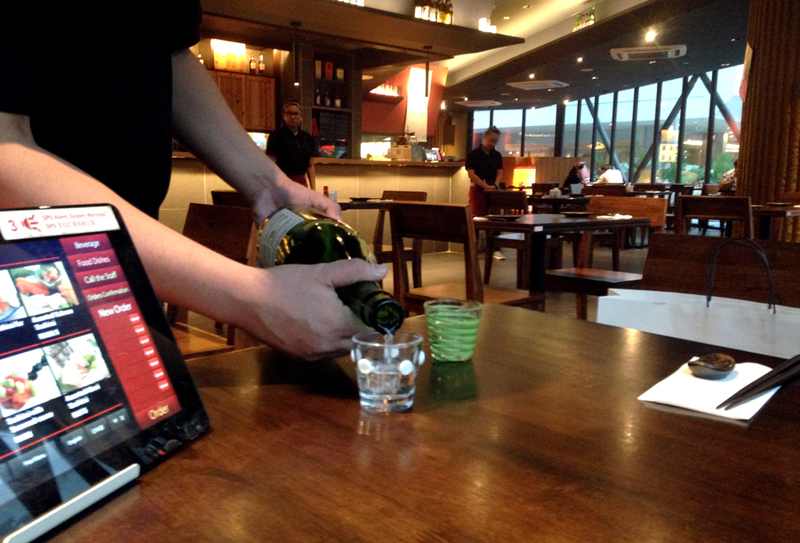 Half the time we order Sake (in most Japanese restaurants), we don't really know much about it. Maybe one day we will appreciate the Sake more. Great experience though!